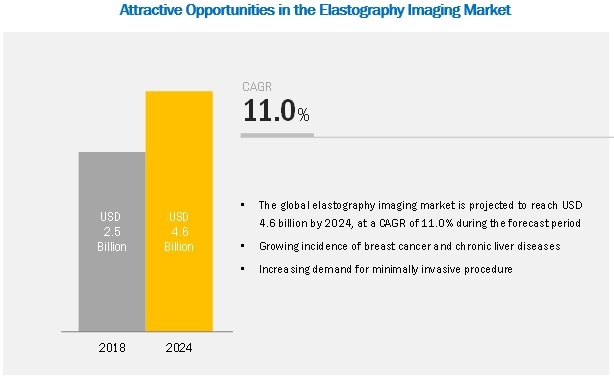 [111 Pages Report] The elastography imaging market is expected to grow from USD 2.5 billion in 2018 to USD 4.6 billion by 2024, at a Compound Annual Growth Rate (CAGR) of 11.0 % during the forecast period. The growth of this market is mainly driven by the growing incidence of breast cancer and chronic liver diseases and a rising preference for minimally invasive procedures across the globe. However, the high cost of elastography imaging systems and an unfavorable reimbursement scenario are expected to restrain the growth of this market to a certain extent. By modality, the ultrasound segment is expected to be the faster-growing in the elastography imaging market during the forecast period. The Radiology/General Imaging segment is expected to be the faster-growing in the elastography imaging market by application during the forecast period. Based on the application, the market is divided into radiology/general imaging, cardiology, OB/Gyn, urology, vascular, orthopedic & musculoskeletal applications and other applications. The radiology/general imaging segment dominates the market. This segment held the largest share in 2018 and is expected to grow at the highest CAGR during the forecast period. The radiological applications of ultrasound include its use in image-guided radiotherapy and in radiology ultrasound (non-radiation-based procedures); whereas, general imaging applications include diagnosis and/or treatment of cancer, abdominal disorders, and soft tissue injuries. Similarly, the rising incidence of various cancers across major markets and the growing market availability of elastography systems. This is a major factor driving the growth of this segment. By End User, hospitals, surgical & diagnostic centers segment is growing at the fastest rate during the forecast period. Based on end user, the market is segmented into hospitals, surgical centers, & diagnostic centers, ambulatory surgical centers and other end users. In 2018, the hospitals, surgical centers, & diagnostic centers segment accounted for the largest share of the elastography imaging market. This segment is also expected to show the highest growth during the forecast period owing to the significant number of ultrasound and MRI-based elastography medical procedures performed in hospitals, growing trend of workflow automation among healthcare providers, and rising adoption of minimally invasive diagnostic & surgical procedures in these facilities. The market is divided into four major regions - North America, Europe, Asia Pacific, and the Rest of the World (RoW). In 2018, Europe is expected to account for the largest share of this market, followed by North America. The large share of this regional segment is attributed to ongoing clinical research projects in elastography, the early commercialization of these devices in the region, and the significant healthcare expenditure across mature European countries. Furthermore, government initiatives for cancer screening, which involve the use of ultrasound systems featuring elastography, are also supporting market growth. The major elastography imaging vendors include GE Healthcare (US), Siemens Healthineers (Germany), Philips Healthcare (Netherlands), Canon Medical System Corporation (Japan), Samsung Medison (South Korea), Hitachi Ltd. (Japan), Shenzhen Mindray Bio-Medical Electronics Co. (China), FUJIFILM Holdings Corporation (Japan), Esaote (Italy), SuperSonic Imagine (France), and Resoundant (US). Philips Healthcare is another major player in the elastography imaging market. Philips Healthcare manufactures its products in 25 countries and distributes these products in over 100 countries, on a global scale. The company pursues inorganic growth strategies such as collaborations and partnerships which further helps in increasing its market presence and strengthening its product portfolio. For instance, Philips Healthcare entered into a partnership with PathAI (US) (March 2017) and Erasmus University Medical Center (Netherlands) (November 2018) with the aim to expand its customer base across the globe. In 2018, GE Healthcare expands collaboration with SonoSim to offer ultrasound training to primary care and point of care users. With this partnership, both companies are focused on enhancing education services for ultrasound users in different areas include women’s health, cardiology, point of care, and primary care. Philips and the Singapore Institute of Advanced Medicine Holdings opened an Advanced Medicine Imaging (AMI) center in Singapore. The AMI center is equipped with advanced imaging systems and aims to provide specialized oncology care to people in the Southeast Asia region. Siemens AG has opened its new corporate headquarters for management of the board and central functions of the firm, including human resources, finance and communications, and marketing. Who are the major market players in elastography imaging market? What are the regional growth trends and the largest revenue-generating region for elastography imaging market? What are the major drivers and opportunities of the elastography imaging market? What are the major test type of elastography imaging? What are the major end user for elastography imaging market? 11.8 Mindray Medical International Ltd. The study involved 4 major activities in estimating the current market size for elastography imaging. Exhaustive secondary research was done to collect information on the market as well as its peer and parent markets. The next step was to validate these findings, assumptions, and sizing with industry experts across the value chain through primary research. Both the top-down and bottom-up approaches were employed to estimate the complete market size. Thereafter, market breakdown and data triangulation were used to estimate the market size of segments and sub-segments. In the secondary research process, various secondary sources such as Hoovers, Bloomberg BusinessWeek, Forbes, and Dun & Bradstreet have been referred to, so as to identify and collect information useful for a technical, market-oriented, and commercial study of the elastography imaging market. These secondary sources included annual reports, press releases & investor presentations of companies, World Health Organization (WHO), Food and Drug Administration (FDA), National Health Service (NHS), Breastcancer.org, American College of Radiology, American College of Cardiology, European Society of Beast Imaging (EUSOBI), International Agency of Research on Cancer, National Breast and Ovarian Cancer Centre. Secondary research was mainly used to obtain key information about the industry’s supply chain, the total pool of key players, market classification, and segmentation, according to the industry trends to the bottom-most level and regional markets. It was also used to obtain information about the key developments from a market-oriented perspective. Key players have been identified through extensive secondary research. The elastography imaging industry’s value chain and market size, in terms of value have been determined through primary and secondary research. After arriving at the overall market size—using the market size estimation processes explained above—the market was split into several segments and sub-segments. To complete the overall market engineering process and arrive at the exact statistics of each market segment and sub-segment, data triangulation and market breakdown procedures were employed, wherever applicable. The data was triangulated by studying various factors and trends from both the demand and supply sides of the elastography imaging industry. This research report categorizes the elastography imaging market based on Modality, Application, End User and Region.